My grandfather, Dr. Robert T. (Bob) Dunstan, was born in Windsor, NC in 1901, the "runt pig of the last litter" of Dr. Henry Vaughn Dunstan, a surgeon and survivor of the Civil War. Our ancestor Saint Dunstan was the Bishop of Glastonbury Abbey in England (where King Arthur is buried) in 950 AD, and became the Arch Bishop of Canterbury later in life. St. Dunstan's Chapel is located in Westminster Abbey, and Dunstanburg Castle is located on the North Umberland coast. John Dunstan came to Jamestown, VA in the 1620s, where there are continuous land ownership records of the Dunstan family, and they moved south to North Carolina in the 1700s. We have the letters from my great grandfather, Dr. H.V. Dunstan (HVD) that he sent back to his first wife from medical school in VA before the Civil War, describing how horrible it was doing the amputations and other surgeries were during the war. Because they were both Masons, General William T. Sherman spared HVD's home and farm in Windsor, NC as Sherman burned his way across the South after burning Atlanta. HVD walked home 500 miles from GA at the end of the war. HVD passed away when Bob Dunstan was only 6 years old, and the young Bob was raised by his mother and two older half-brothers. Bob Dunstan went to college at Trinity College (now Duke University), paid for with skins he hunted and trapped in the Albemarle swamps near Windsor. He majored in languages, receive his PhD, and became a professor of Romance Languages at the Women's College in Greensboro, NC. While he was in college, he was house-sitting for a professor who was away on sabbatical in France. The professor collected roses and sent home some grape vines along with rose plants. This was how Bob Dunstan became interested in the plants and soon began experimenting with growing grapes. He said that on the weekends he would play grapes instead of golf. The French wine grapes sent by his professor died, killed by a virus called Pierce's disease, while the native American muscadines and scuppernongs thrived. Bob Dunstan set about trying to cross the two species to see if he could create a hybrid that would bear the beautiful bunch grape fruit that made the wonderful wines of France and California. Because the two species have different numbers of chromosomes, all of his efforts in breeding failed; the hybrids were sterile. However, by chance, Dunstan tried doubling the number of chromosomes using the mutagenic chemical Colchicine. The use of the tetraploid vines enabled the hybrids to become fertile and produce seed! He sent plants to geneticist, Dr. Haig Dermen, at the USDA Station at Beltsville. Dermen confirmed the hybridity and Dunstan published a ground-breaking article in the Journal of Heredity describing his work. The hybrid grapes produced by Dunstan's crosses proved to have excellent resistance to Phylloxera, an aphid-like insect that was decimating the vineyards of France. By grafting the French wine grapes onto the hybrid rootstock, the vines became resistant to the infestation. This discovery saved so many vineyards in France that the Societe du Vin gave Dunstan a national award of honor, and he traveled to Paris and gave his acceptance speech in French. This technique became very important in the effort to establish a wine grape industry in the eastern United States. Dunstan became widely known in plant circles for his work and retired to Alachua, FL in 1962 to continue his breeding efforts full time. He became known as one of the "3 Bobs", a trio of amateur ("those who do it for love") grape breeders along with his close friend Bob Zehnder of Summerville, SC and Bob Farrer. He produced a number of new varieties and his genetic material was used in further crosses by many other breeders. Grandpa jokingly referred to himself as "a pimp to pollen"! Dunstan was also a member of Northern Nut Growers Association (NNGA) since the 1930s (which had its 100th anniversary in 2009) and we have letters to him written by noted plant geographer and world explorer J. Russell Smith. 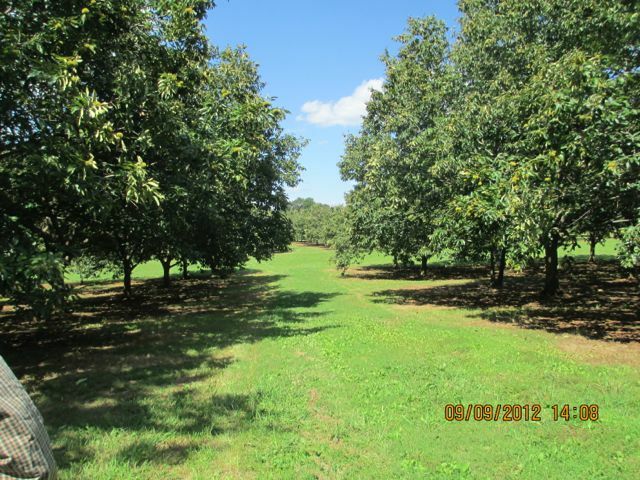 It was Dunstan's affiliation with NNGA that provided him with the cuttings of the surviving American chestnut that he crossed with Chinese chestnuts to produce the Dunstan Hybrid Chestnut. Dunstan was also a founding member of the North American Fruit Explorers (NAFEX), a group of amateurs devoted to the collection and development of unique and rare fruit. He collected all kinds of fruit and nut trees - the orchards he planted around his house on our farm in Alachua still produce chestnuts, pecans, hicans, native and kaki persimmons, jujubes, citrus, bananas, figs, mulberries, pears, and grapes.